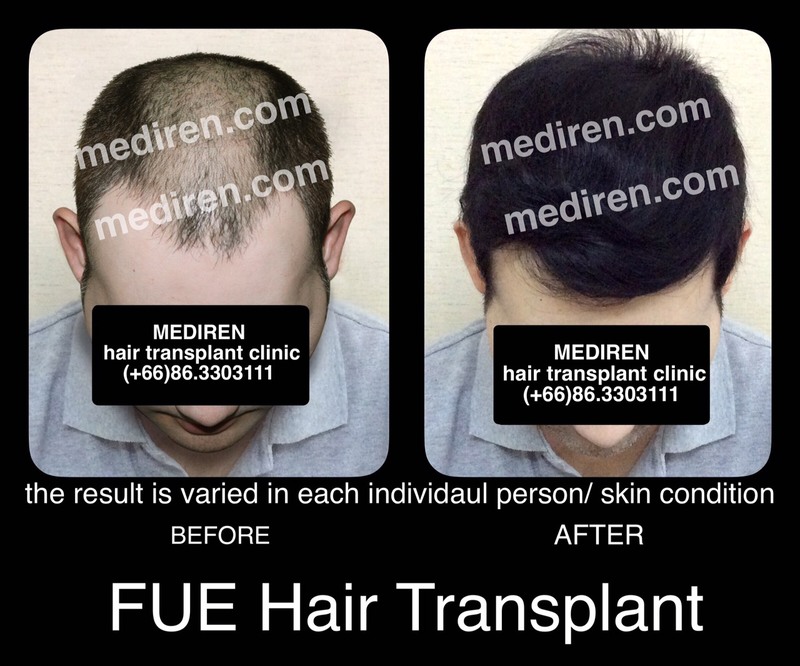 Mediren Clinic FUE Center, The best in FUE. 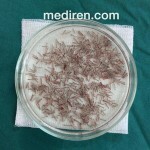 Mediren Clinic is the one-stop-service center for hair solution. 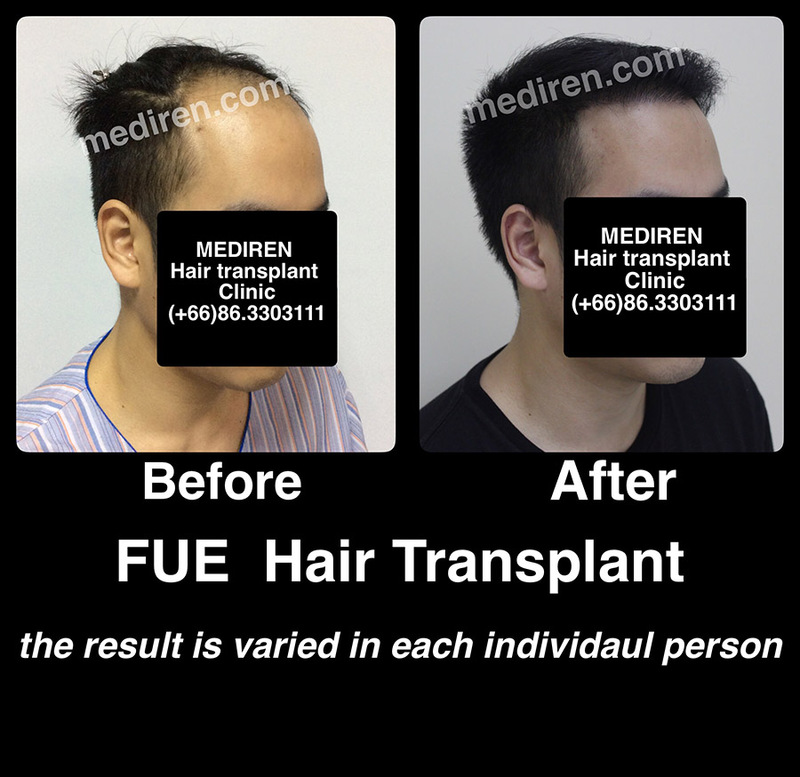 Our team consists of Doctor, Pharmacists and Nurses who specialize in FUE Hair Transplant. 1. No blades and no operations. The wound is as minimal as very shallow-needle-size and self-healed. 2. Excellent result, as accepted worldwide, reflexing from no long-delayed period classifying graft from its skin. 3. Every graft is handled by specialized doctor. 4. Look natural, no scars and no long horizontal operative wounds. 1. The operation is by cutting head skin in long horizontal range. 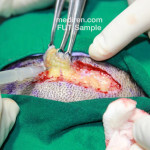 Suture and its removal are needed. 2. 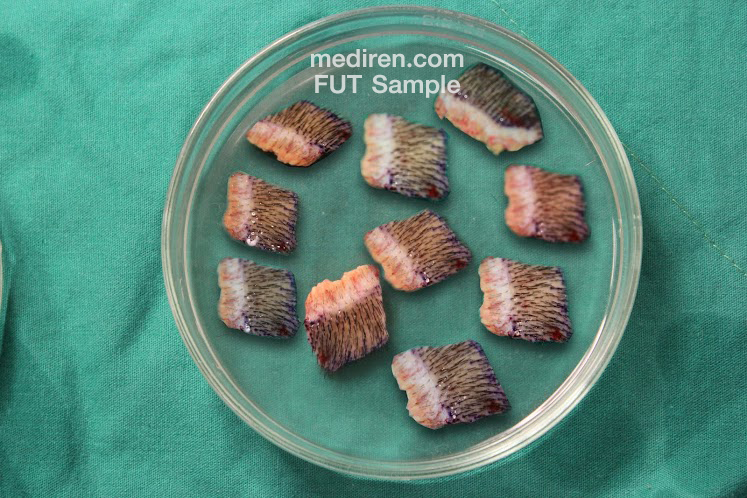 Moderate result is caused by long-delayed period of graft and its skin classification. 3. 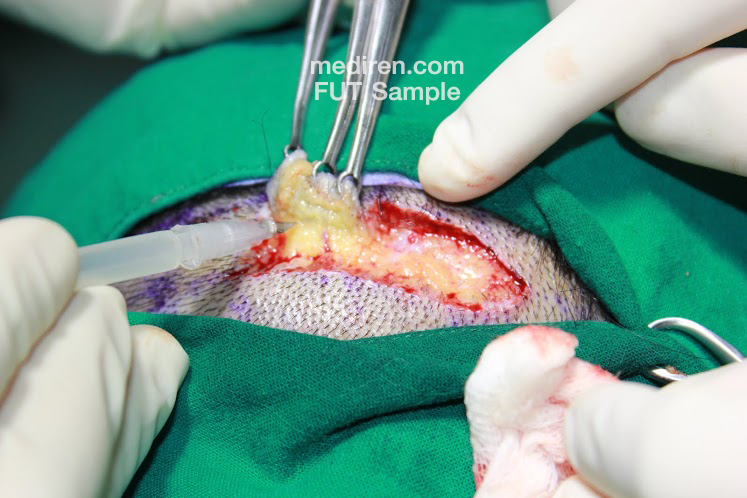 Doctor brings out graft and its skin through operation while assistant handles graft and its skin classification. 4. Long and wide scar remains after the process. 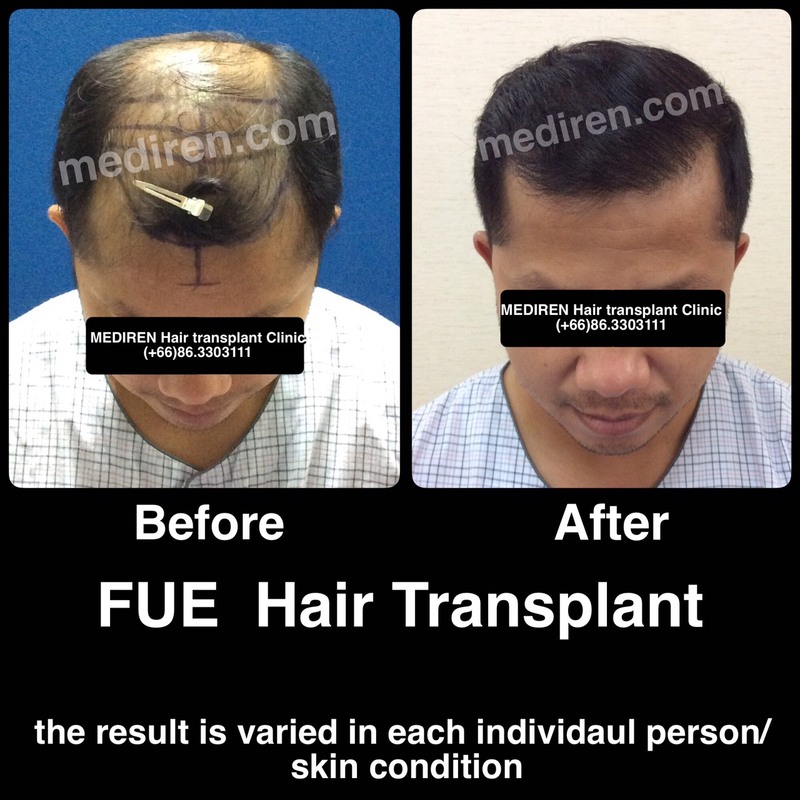 FUE is a type of hair transplant by genuine hair graft without operation. The very small wound is self-healed. No skin cutting or suture are needed. 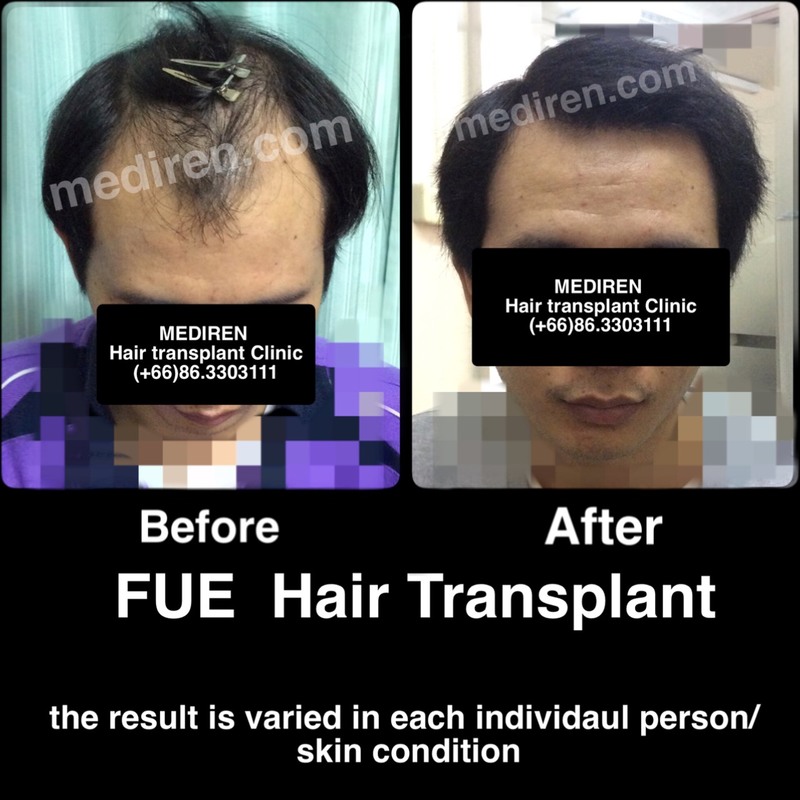 The process is not painful as FUT, The transplanted hair is strong and healthy. 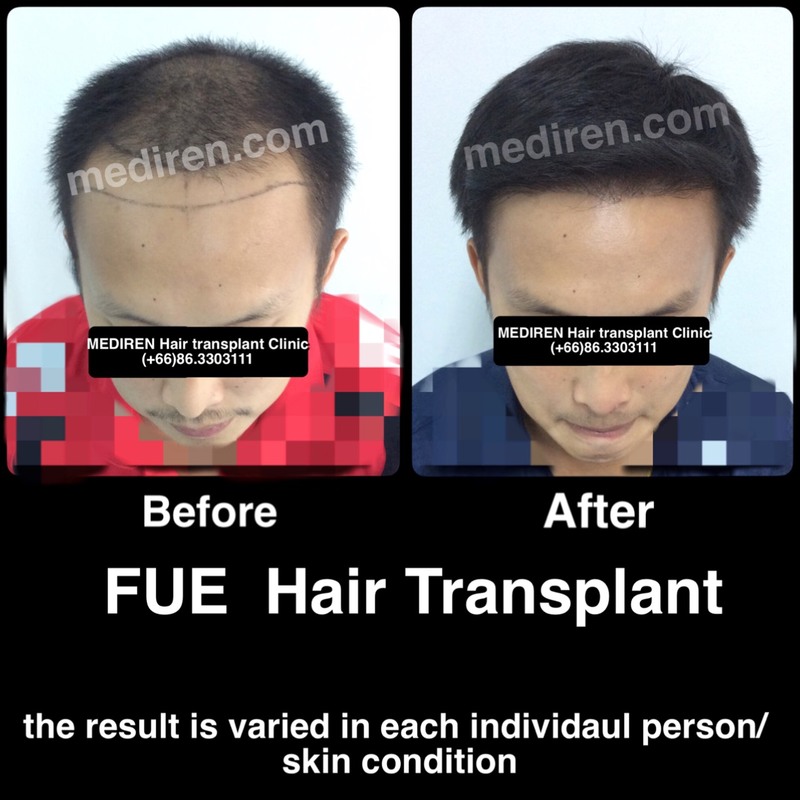 FUE is a modern technique and generate extremely better result rate than FUT (when handled by FUE-specialized doctor only). 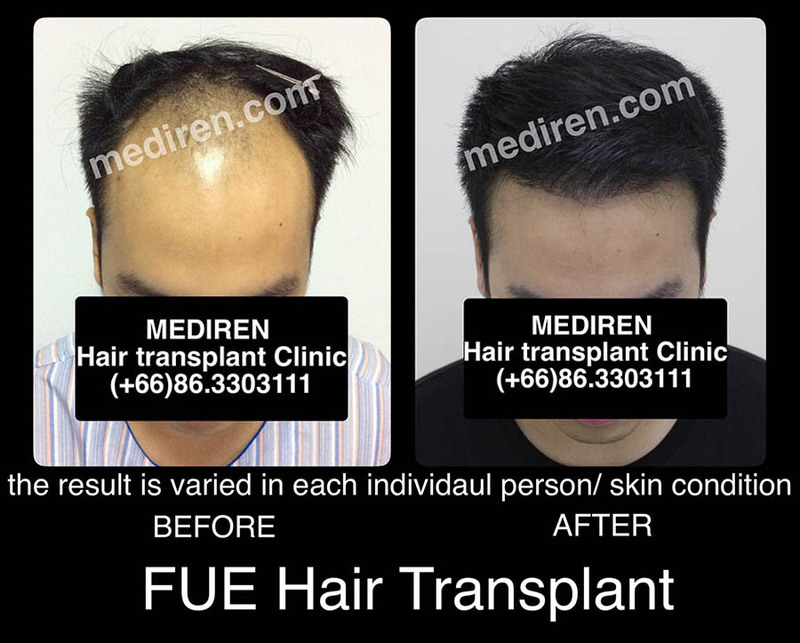 FUE Hair Transplant requires the extremely high skill. Unskilled or erroneous lead to the lost of the hair root and almost impossible to resolve. 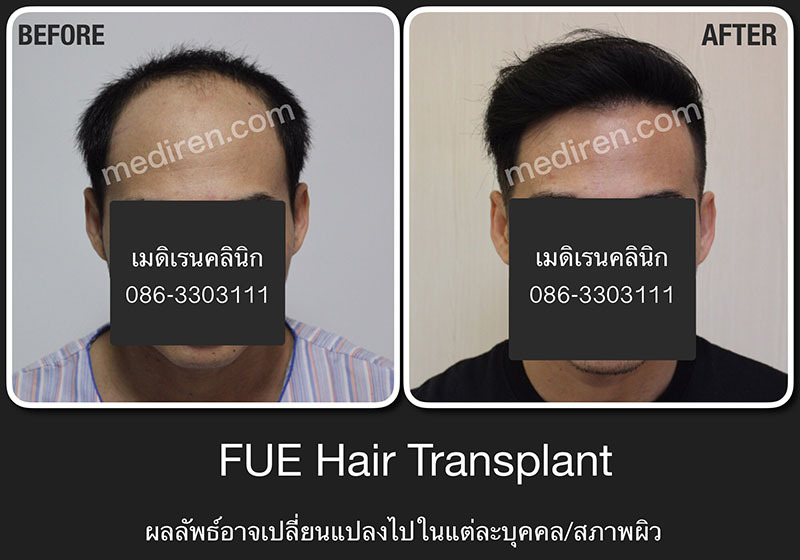 It is suggested to receive the service from the American Board of Hair Restoration Surgery Doctor (ABHRS) and specialized in FUE Technique only. 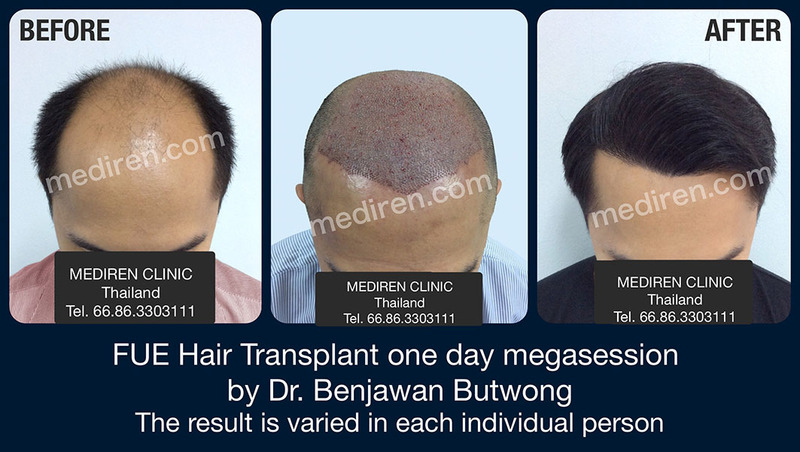 Mediren Clinic put the entire effort on Hair Transplant only by the American Board of Hair Restoration Surgery Doctor (ABHRS). 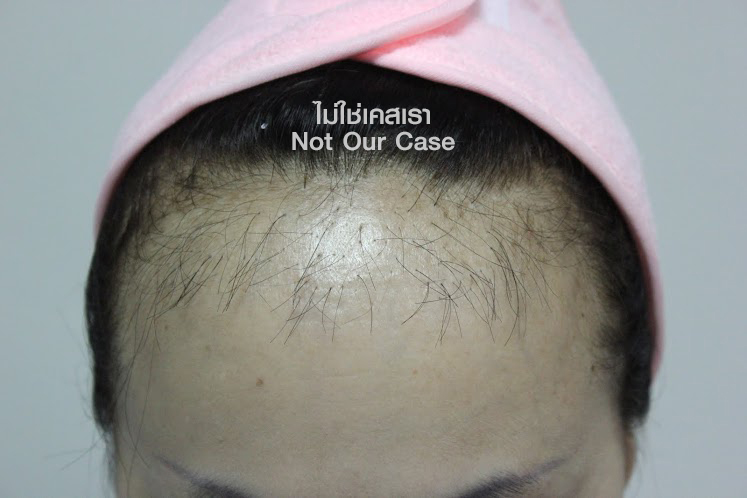 We are not regular Derma-Institute taking only a hair transplant day-course to South Korea and only perform hair transplant as part-time job which is hazardous to unsuccessful hair transplant result and damage. 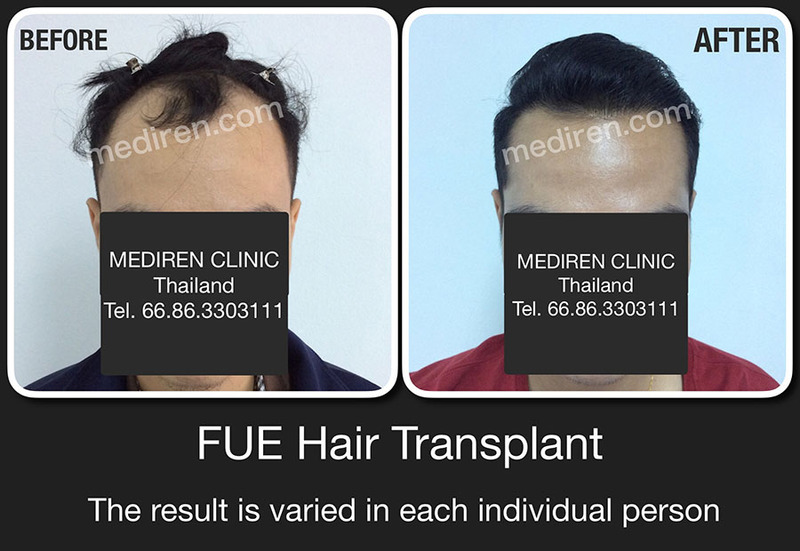 Mediren Clinic Bangkok insists we, the best in FUE, are the sole Hair Transplant Clinic. 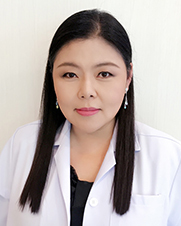 Not to be confused by other ordinary skin clinics, who do Hair Transplant as an additional job, located in nearby area. 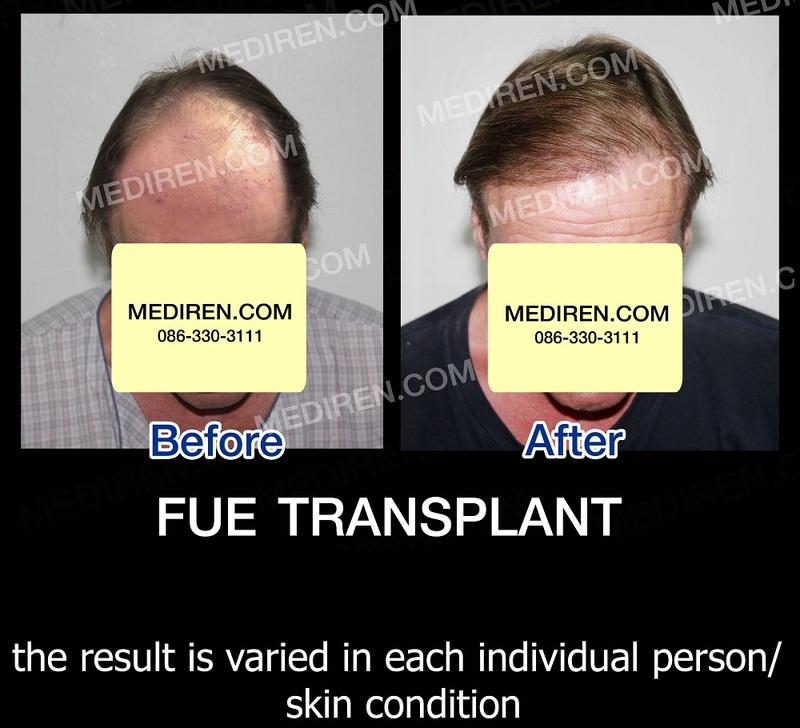 We provide genuinely effective FUE. 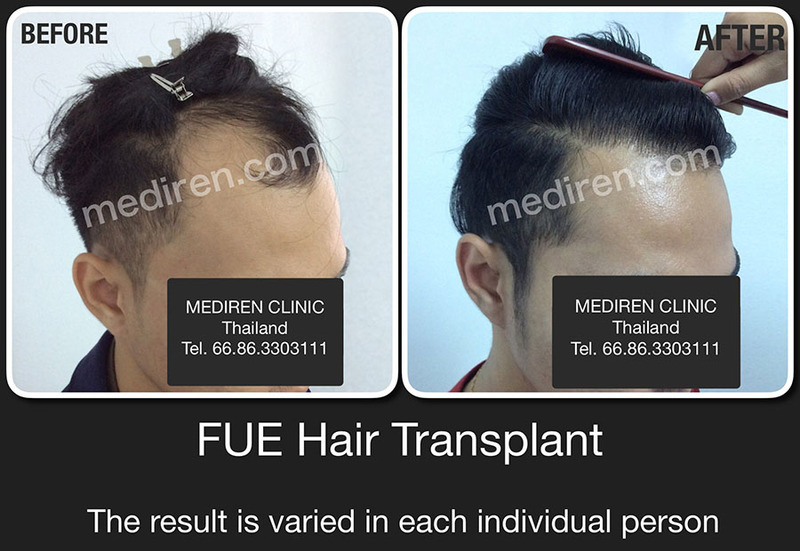 FUE Technique is highly relied on the doctor’s skill. 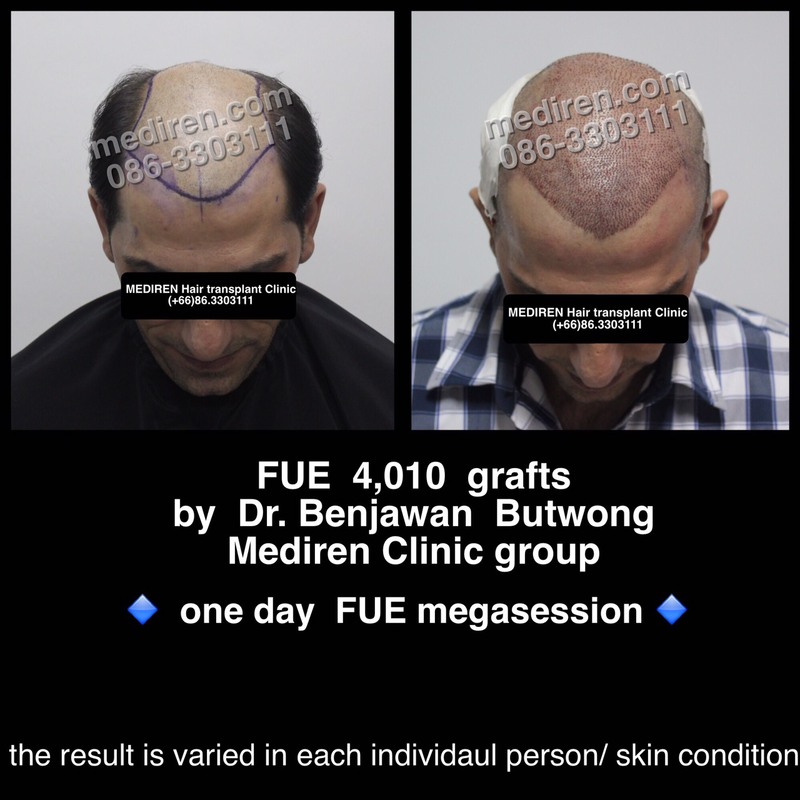 This is the reason your selection must be based on specialized and genuinely effective FUE clinic only as seen in leading FUE Centers worldwide. 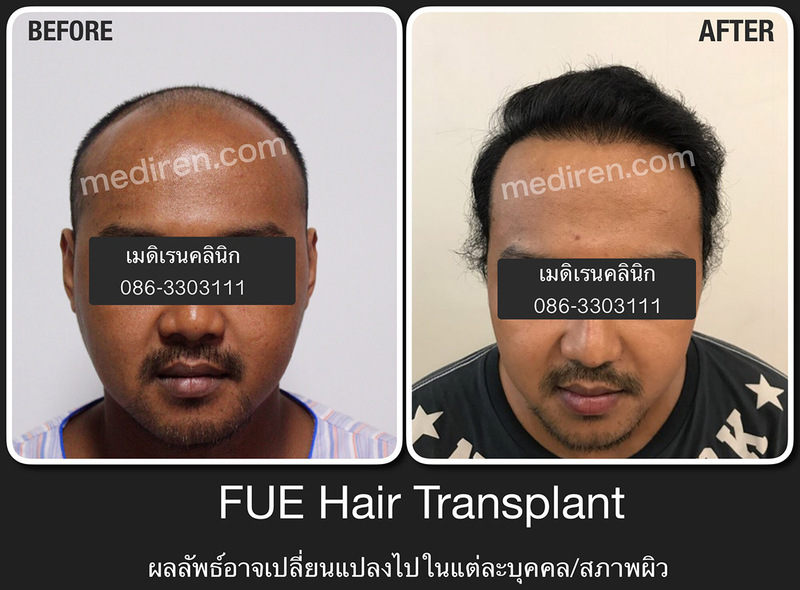 The difference of each sub-method in FUE technique. Doctor controls the manual device to extract graft by graft. The disadvantage is time consuming and quite impossibility to perform Mega Session. The doctor controls Motorized FUE Machine (performed by the doctor’s hand every single graft). 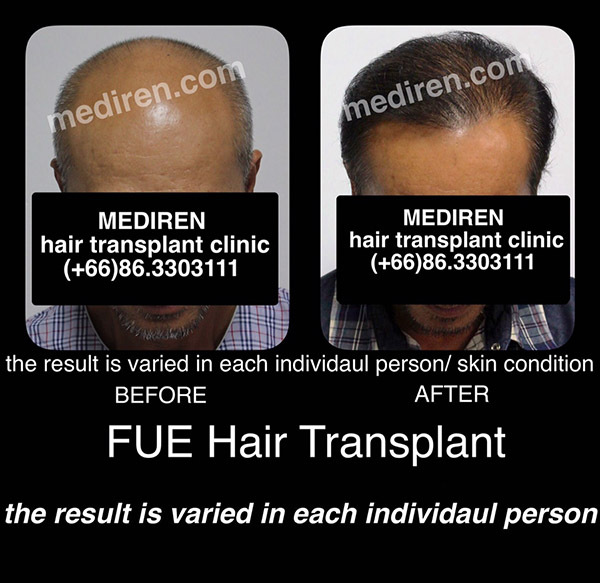 - Accurate, rapid and less lost (when handled by specialized-FUE doctor only). 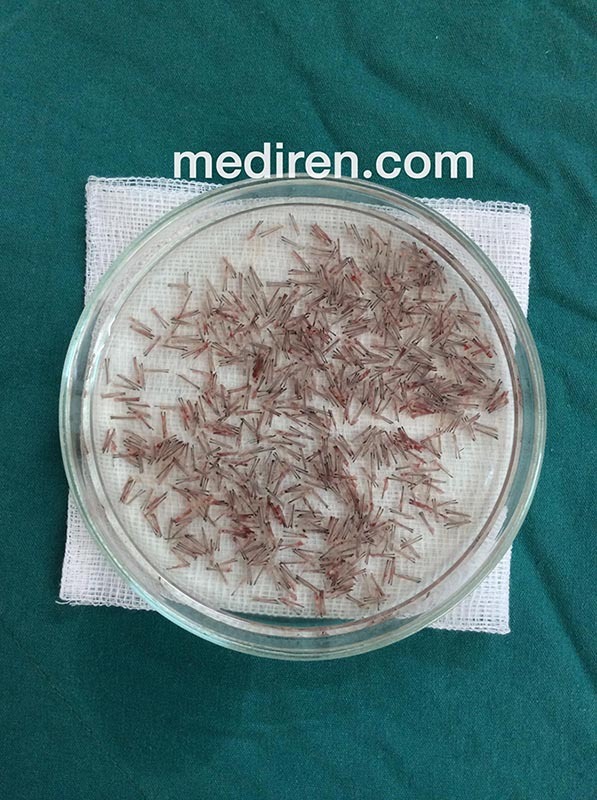 - Graft collection can be performed, no limitation, in every angle and area of The Safe Zone. - No unnecessary and wasted hidden costs. Our Mediren Clinic performs this technique as other leading FUE Centers worldwide. With the average speed more than 1,000 graft per hour. By the limitation of the standard Motorized FUE Machine technique which highly reliable on each doctor’s skill, some medical equipment companies then invite programmed robot to control Motorized FUE Machine. - After the robotic punching, manual graft collection in the very time-consuming period is still needed. - Robotic program is highly limited in several aspects (e.g. mostly performing is a square area). 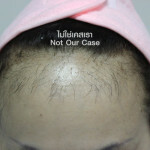 - Comes with a hidden cost (extra multi-ten THB per graft). 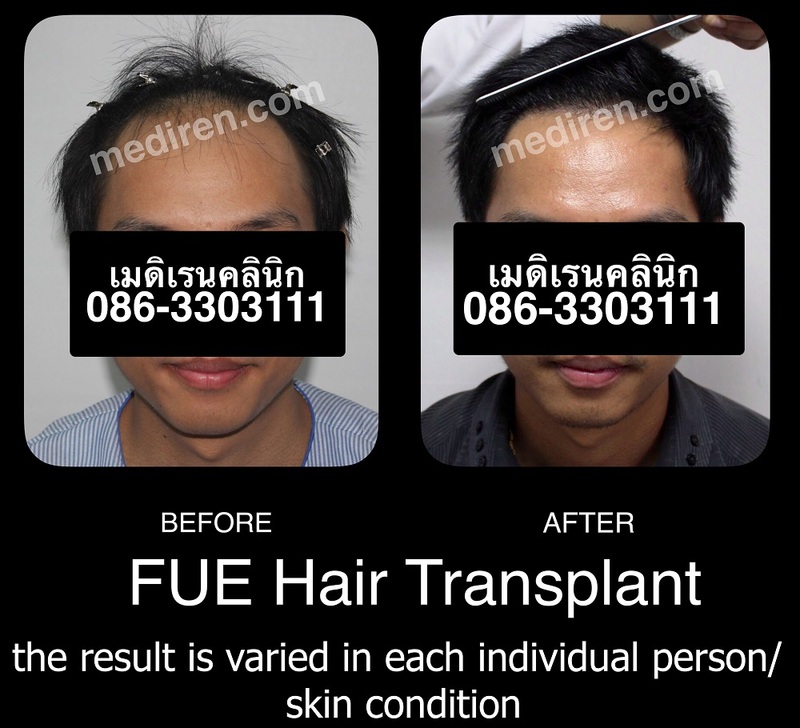 A : FUE is result-oriented technique and highly popular (required more doctor’s skill than FUT). 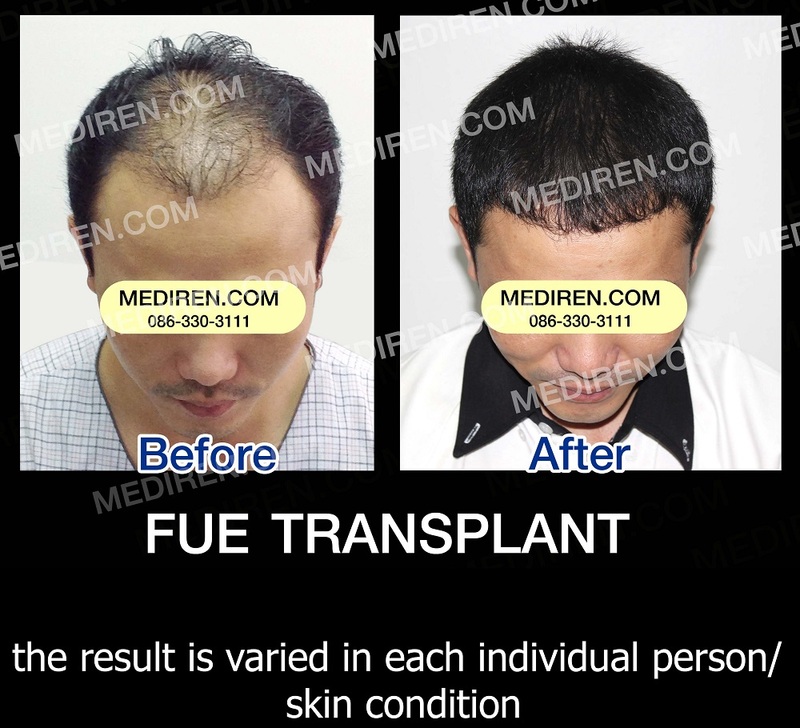 Most clinics advertises as FUE available. 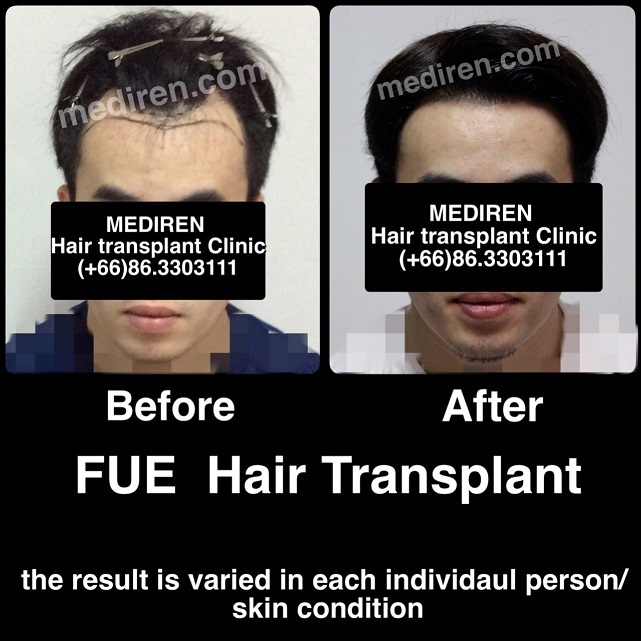 However, are those clinic really capable of performing FUE is considered by the doctor’s skill, the actual amount of transplanted grafts and suitability to the patient. 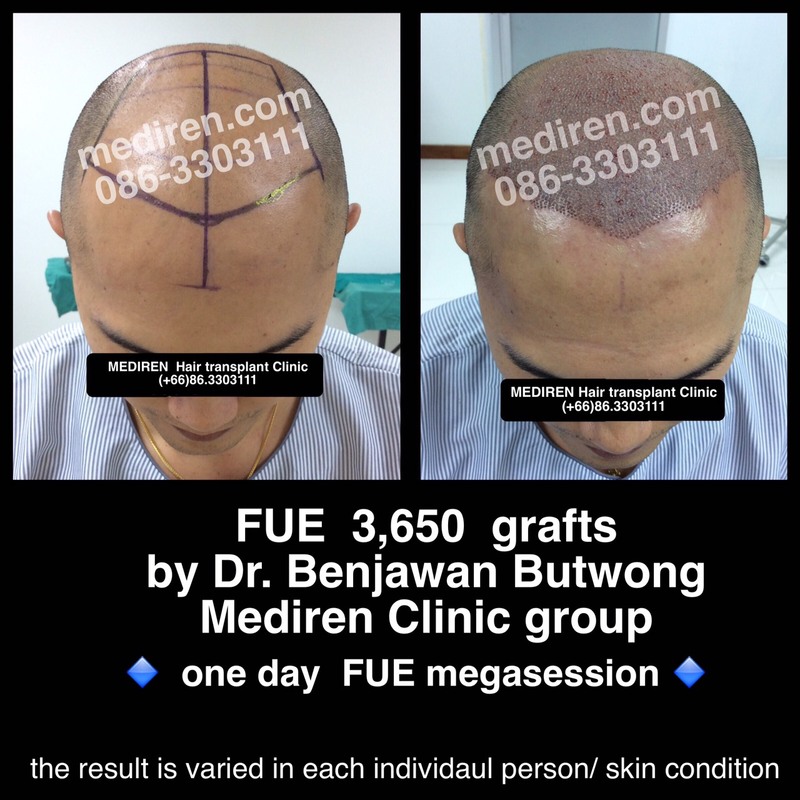 At Mediren Clinic, we are capable of performing FUE as maximum as 2,800 grafts per day (Mega Session). 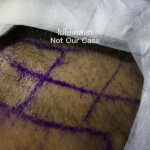 99% of our cases are performed by FUE technique. Q : Is Robotic FUE available in other countries? A : Robotic FUE is available in some countries. However, Leading FUE Center Clinics still perform Motorized FUE by doctor and only use Robotic-FUE for advertisement and public relations only. 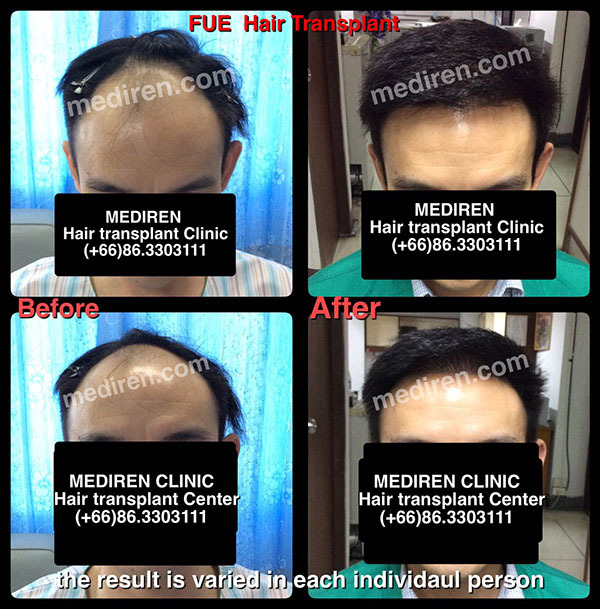 Q : Why is Mediren Clinic capable of offering FUE in low price? Q : Are surgical assistants of Mediren Clinic skillful? 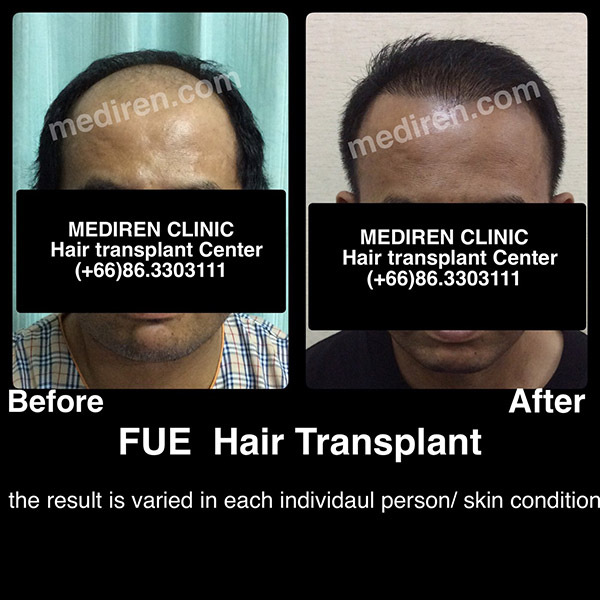 A : At Mediren Clinic, our long-experienced surgical assistants have performed and been trained in FUE and FUT Hair Transplant Cases from several countries. 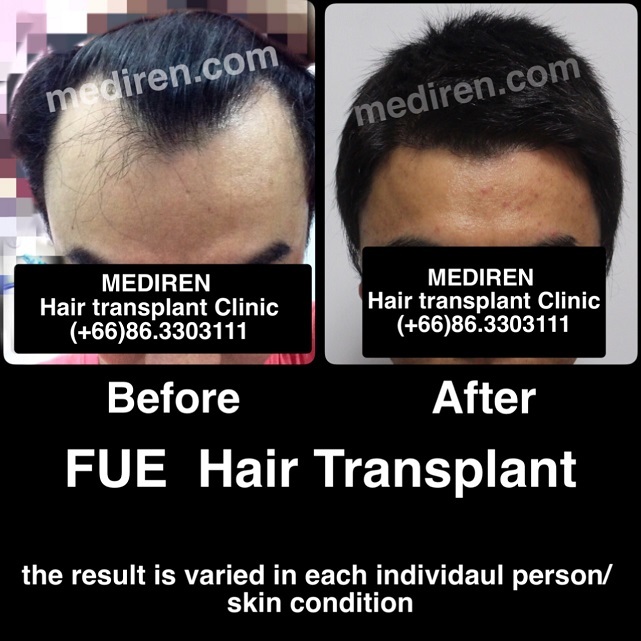 Q : Should I purchase a 50% sales promotional Hair Transplant service or unreasonable low price as offered in some other clinics? Only almost 30 transplanted hairs growing up with 12 cm-long scar at the back side. 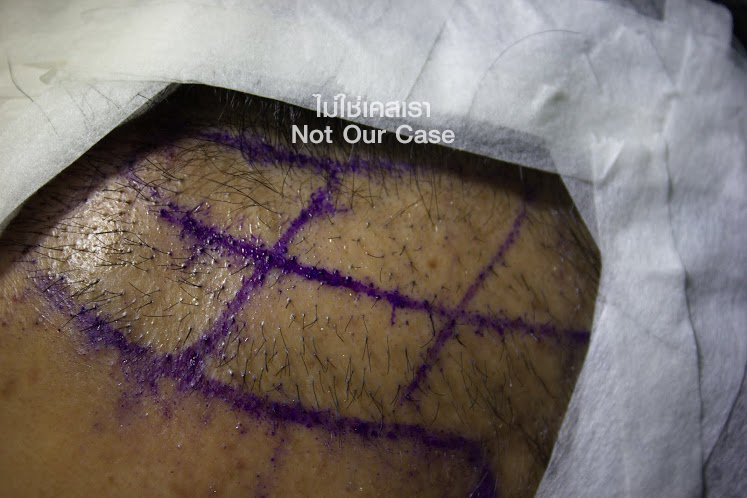 Each transplanted hair is 1 cm away from each other. Q : How does Mediren Clinic perform an assessment? A : We perform assessment as actual, no over-estimation. Every graft is counted, not just a rough approximation, you can rest assured your money is not lost. Q : What is the difference between Graft-Assessment and Hair-Assessment? A : All leading Hair Transplant Establishments suggest Graft-Assessment. One graft is equivalent to 2–3 hairs on average. 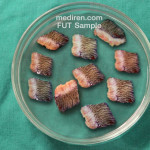 To make Hair Assessment by multiplying the graft number with 3 is considered unreasonably rough assessment. How it seems bigger in the number of graft makes it applied in term of marketing in some places, however, it is not applied in term of medical principle.